The Cardboard Castle at its current state of completion. I built this thing from Ritz Cracker boxes and a wooden bird house. I have shared before the fact that those of us who are pessimists are never unpleasantly surprised. We plan for failure, and cannot be destroyed by the worst that can happen. Being indestructible is a very good thing. In fact, it is a super power, just like the Incredible Hulk or something. Yesterday a year’s worth of work and waiting came to an end. I reached the final round of the Chanticleer Book Reviews’ Rosetti Awards for YA novel writing. I had a second chance to win a prize and a second chance to be noticed by literary agents, publishers, and the reading public. But it ended the same way as the first chance did. Magical Miss Morgan didn’t win. So, I have to rely on my super powers once again to navigate my way through the dark valleys where a body lands once we fall off the mountain we are climbing. I spent a good deal of time this weekend doing little things to make myself feel better. I worked on my cardboard castle project. I took my daughter, the Princess, on a daddy-daughter date. We saw a very good movie, The Good Dinosaur from Pixar, and we had dinner at a Steak n’ Shake in Plano, Texas. Last night my wife and I watched the finale of Downton Abbey on PBS. I am not devastated. I didn’t win. I didn’t get the boost I had hoped for in marketing and publication and seeing my stories in print. But the book still exists. There are still ways to get it published. And I still believe it is a very good piece of writing. So being a pessimist and preparing for the worst held up as a super power. I should get a black cape and black tights. Gloomy Man to the rescue! Villains and opposers will find me indestructible. I will find a way to save the day! This is a re-post of an old poem with a new Paffooney. My teenage son and I have been through some rough times. One time, though, we sat down and talked about him wanting to be a music composer. I realized then that the things I have been through as a writer, being discouraged by other, more sensible people, having to defend my art, and not even being believed in by my own family, were the very things that he was talking about. So I wrote a poem about it. 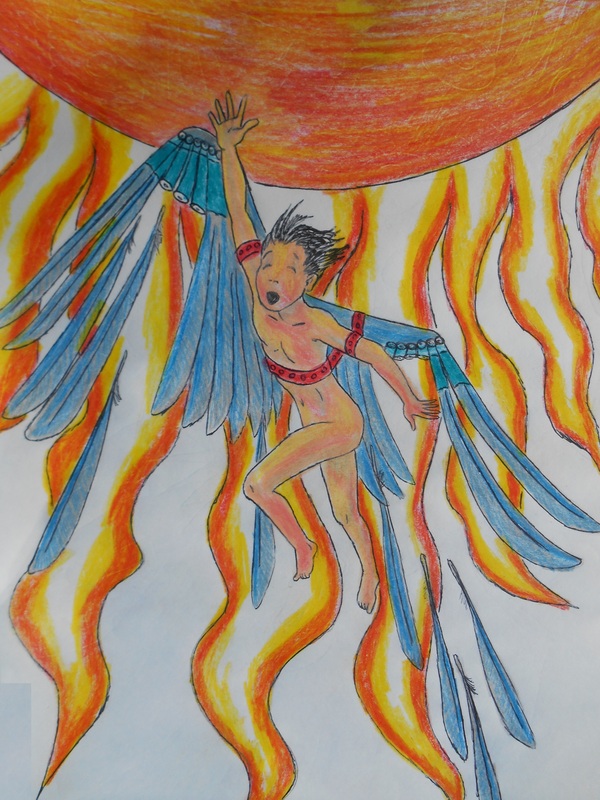 The central metaphor is Icarus from classical mythology. I even suggested he use it as lyrics and turn it into a song. Of course he told me how stupid that idea was. So let me put the poem here and see what you think.